Dave has played everywhere from the Los Angeles Colosseum for 100,000 to The Denver Art Museum and just about everything in between. Some notables Dave has played with either on recordings or on the same stage include Nathan East, The Denver Nuggets (National Anthem), Abraham Laboriel, Stan Getz, Carmine Rojas, Hugh McCracken, "Film at the Rocks" (Red Rocks w. Opie Gone Bad), Charlie Pride, "Promise Keepers" (Los Angeles Colosseum, Mile High Stadium, Soldier Field Chicago, Texas Stadium, RCA Dome Indianapolis, Georgia Dome, Devil Ray Stadium, Chargers Stadium San Diego, Fl., Kingdome Seattle), Pepsi Center (Denver Nuggets), Irvine Meadows Ampitheater (Calvary Chapel San Juan Capistrano Easter Celebration), The Forum Inglewood, Ca. (Opening for Amy Grant), Jon Gibson, Cherry Creek Arts Festival (Michael Friedman), Freddy Fender, Steve Taylor (5 c.d. recordings including Grammy Nominated "Meltdown", 10 international tours in North America, Europe, South America and Australia), Beijing China (Confluence Ministries), Fiddlers Green Ampitheater (Cherry Hills Comm. Church Easter), Rob Mullins, Anaheim, Calif. Pond (Ducks Arena), Omni Horizon Arena (Chicago), Odeon Arena (London, England), Red Rocks Ampitheater, Denver. Co. (Sheila Walsh, Opie Gone Bad), "Taste Of Colorado" (Confluence), Cinco De Mayo Denver (Confluence), and Many more. ​ Dave has recorded two solo c.d.s including "Thrushour Music to make it through your day" Nominated for a "Dove Award" in 1995 Sparrow/EMI, and "Dave Thrush Christmas" an Independent project. Dave began his Professional musical Career in Colorado. At age 17 as he was encouraged by his mother to form a band with teenage Friends, Randy Chavez, (Opie Gone Bad), John Falk,and Andy Rodriguez called aptly, "Thrush". Thrush was a jazz fusion group playing songs by Jeff Lorber, Grover Washington, Tower of Power, and Average White Band Where there first paid performance was for a Lowry Air Force Base Dance. 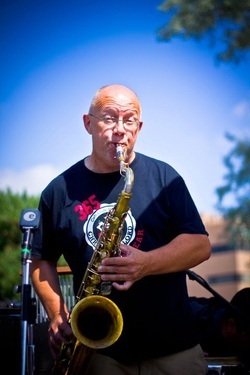 After College Dave began working in the Mile High City for Jazz, Latin, top 40, and funk groups opening for national acts like Tierra, The Bar Kays, Stan Getz, Charlie Pride and Freddy Fender. In 1982, Dave recorded a demo with High School friend Steve Taylor called "I want to be a Clone", and Taylor was Immediately signed to Gospel label Sparrow,(now EMI CMG), and Taylor along with Dave, Cactus Moser,(Highway 101, Wynona Judd), Kerry Connor and Jeff Stone on guitar, Woody Waddel on Keys, Chris Richards and Glen Holmen on Bass went on the road as "Steve Taylor and Some Band". It was during this period that Dave became a Christian and started following Jesus. After recording 5 albums and countless National and International tours with Taylor, the band broke up and Dave moved to Los Angeles working with numerous local and National acts like "Promise Keepers", and "New Young Messiah" Christmas tour. In 1995, Dave recorded a solo c.d. entitled "Thrush Hour Music to make it through your day", for the same Sparrow label in Nashvillle Tn. which was nominated for a Dove award. After 11 years in L.A. and Orange County Ca. Dave and his Family moved back to Denver where he recorded "Dave Thrush- Christmas" in 1998.